These three valuable lessons learned will help you develop VR training. Virtual reality (VR), augmented reality (AR), and the Internet of Things (IoT) may still sound futuristic to some, but to say these emerging technologies are the future would be incorrect: They are already here. We are only scratching the surface of their potential, and who knows where these technologies might take us. At SweetRush, we’ve made it a mission to make the most of these emerging technologies, applying them to our work in eLearning, training, and learning and development (L&D). That was made clear with SweetRush’s recent acquisition of IDEA Workshop, a Costa Rica-based company that specializes in VR, AR, and IoT. IDEA is being absorbed into our newly formed emerging tech group, SPARK, and IDEA’s cofounder, Adrian Soto, is our new Director of Future Technologies. Developing VR training is somewhat like being pioneers in the Wild West: The territory is largely unknown, and much of the focus of this new technology is outside of learning. The technology itself is changing at a rapid pace—just when you think you have a good handle on the options, new equipment is launched in the market. While many of the foundation principles of user interface and user experience apply, moving into a 3D virtual space introduces a whole new set of opportunities and considerations for designers. The vast amount of details that VR developers are working with is staggering. It’s a whole new (virtual) world. This makes user testing absolutely essential. The goal is to create an environment that is simple and intuitive for the widest spectrum of learners—from those who have picked up a video game joystick only a few times to more experienced gamers. Lesson 1: When choosing your VR environment, consider your audience, learning objectives, and the complexity of the environment itself. In virtual reality experiences, the environment is one of main characters in the story. When you put on the headset, where will you be taken to? Often the choice of environment goes hand in hand with reinforcing the learning objectives and understanding the audience. After all, our mission here is not just to transport people to another world, but to have them learn something in the process. In the upfront stages of working together, we often spend time brainstorming with our clients and advising them on which of their training needs is the right fit for VR. One of the frequent questions that comes up: When does it make sense to re-create a real environment as a virtual 3D environment within VR? The simple answer: it depends! Here are a couple examples to help illustrate this. Let’s say you want to train hospitality workers how to clean guest rooms. You’re in a hotel, and you have access to hundreds of guest rooms, and it’s easy and safe to show them how to clean a room live and in person. Bottom line: not a good use of VR—there’s no need to re-create a real environment that you have readily available in person. Now let’s say you want to onboard new people working at corporate HQ about what it’s like to be a hospitality worker and clean those rooms. These new people develop all the policies and procedures that affect the people who work in the hotels, so it’s important that they really understand how complex those jobs are, and have empathy for those workers. But, sending your corporate team to hotels means a lot of coordination and disruption for the hotel staff, not to mention it’s time consuming and expensive. Now you’ve landed on an objective and an audience that makes sense for VR. The lesson learned here is you absolutely can re-create a real environment in VR—but the key is to make sure that your proposed VR training is actually a good use of VR. So, if you are going to re-create a real environment, the next factor to consider is complexity. To help your VR developer assess this, provide good-quality photographs of the real location from many different angles. As our client cautions, “You need to remain aware that the more complex the location, the more hours and effort required.” And she’s right: The greater the size and scale, and variety of objects and textures, the more time consuming it will be to build. We’ve also found that a high level of detail and quality can result in stakeholders needing some education about what they’re seeing! “Because the quality of the 3D objects was so high, people assumed they were photographs and would then miscalculate the amount of effort and work that goes into creating each scene,” said our client. Be prepared to provide supporting explanations for the process of building the objects and environments in 3D. But if people mistake your 3D for photography…well, that means you’ve really nailed it in terms of quality! Lesson 2: Create a minimum viable product (MVP) to win over stakeholders and strengthen the business case. For many organizations—and the vast majority of learners—VR training is a completely new concept. Within L&D, there are pioneers eager to put the technology to use and create engaging, effective learning, and others who, understandably, have some fear and concerns when determining if the investment is really worth it. How can they try out a smaller piece before biting off something larger? Enter the MVP. In our experience, the definition of an MVP may vary depending on the project, but often it only needs to be a small portion of the overall experience—for example, one room or scene, or one activity—developed as a nearly fully finished product. This allows stakeholders to see the level of detail and quality that’s planned for the full VR training. As our client explains, “In essence, doing an MVP means proving the effectiveness of the application of VR in certain learning interventions.” It helps achieve buy-in with stakeholders, who can personally go through the experience and see that more should be invested, and it also helps you gain insights from your learners (via pilot testing) on what works and what does not. What are the minimum essential features, design, and functionality needed? Do you need to gain further insight into what will work with the target audience that can only be achieved by building out a more polished example? Do you know how you will build it? Once you’ve defined what will be included in the MVP, the next step is to manage stakeholder expectations. Prepare them for what they will see and experience, and be specific about what type of feedback will help you at this stage. That’s true: It is natural to compare the VR environment to the real environment, particularly if your stakeholder works in that environment day to day. If your stakeholders get stuck on the details, acknowledge them and gently help them move on through the activity. After testing, you can review and see which details are most important to correct. What we often find is somewhat the opposite: Stakeholders are so blown away by the level of detail and quality that they spend time looking around and commenting on different features in the VR environment! Lesson 3: Design for your audience and onboard them. At this point in time, the vast majority of learners have no prior experience using VR equipment. However, with regard to their past experience with video games, there is a big spectrum, from those who play games infrequently to more avid gamers. Since the VR controllers share some similarities to game controllers, this is an important factor in overall user experience design. Our goal is to make it as intuitive as possible for both non-gamers and gamers alike. So we start first with the controllers themselves; this is where user testing becomes crucial. Seeing how people interact with the controls and which buttons they find challenging is eye opening. For example, with one project in which the Oculus Rift was used, seeing first hand how learners interacted with the controllers, our team realized that they needed to remove the Rift button functions and reprogram it so the trigger button does everything, which made the experience easier for learners. Another aspect that needs to be considered is instructions and how learners are “onboarded” on how to perform actions in the VR environment. Our client put it best: “To be truly effective—and not confuse learners—you need to both explain and demonstrate what they need to do before you give them permission to do it.” Without the proper flow of onboarding, learners may press every button to try to perform the action. In our experience, the best practice is to provide very short onboarding activities directly before they have to perform that action in the real activity. Show them how it’s done, and then let them do it. Some learners—particularly those with little to no video game experience—may still need a little help from a live facilitator, but with proper onboarding, most will pick it up right away. 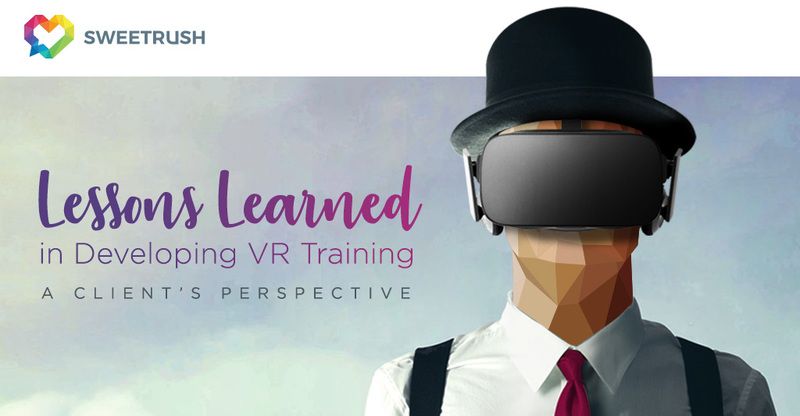 As our client said, “What all of this underscores is the importance of testing the VR training with your learner audience before you officially launch.” We agree! Working with virtual reality in learning places you at the cutting edge of the industry. And being cutting edge means adding risk, complexity, and, yes, at times stress. It also means that every day brings new challenges and new lessons to be learned. Working with VR is also a lot of fun and a unique experience. Make sure you stop every now and then to remind yourself what a great opportunity this is! These are great insights, and, agreed, working at the cutting edge of the industry means taking some risks! Remember that there are methodologies such as MVPs discussed above, as well as proofs of concept and prototypes that can help reduce risks and gain buy-in. Working with VR opens a whole new world of possibilities for our industry. One day, I predict we’ll look back and find it hard to remember a time when it was not mainstream, as I am sure my five-year-old daughter will when she thinks about cell phones and possibly even self-driving cars. We’re excited to keep pushing forward and finding new ways in which this emerging technology can help us evolve and improve the performance of our clients’ employees. I’d like to thank our client for sharing her experience and providing her perspective. This is only the beginning for SweetRush and our clients in developing VR training. Stay tuned for many more insights from SPARK about emerging technologies. Are you interested in finding out more about using emerging technologies and VR for learning? Meet us and join our presentation at ATD 2018, Realities360, or TICE! John-Carlos Lozano is SweetRush’s Chief Creative Officer. Read more articles by John-Carlos or read his full bio here.